New Orleans East is an area with seven times the national population growth rate and an estimated 100,000 people with median household income of $43,000 who are underserved by businesses yet to come back to the area. An opportunity exists for retail businesses to come to the area and this report examines which businesses are in demand. Our analysis shows a current need for furniture stores, supermarkets, lawn and garden stores, sporting goods and clothing stores. This report examines not only the demographics of population, income and age, but also the consumer spending behavior and compares spending in this area to the national average in a variety of categories to determine where spending is higher than normal, called the Market Potential Index. We also conduct a Retail Gap Analysis, where we determine where the gaps are in money spent on goods and services and businesses selling goods and services, and calculate the Leakage Factor showing money spent outside the area which could be spent inside the area, if only businesses were there to provide the goods and services. 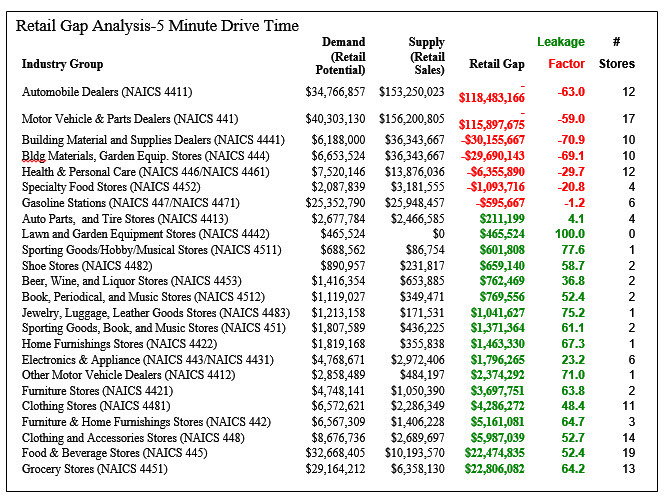 This analysis shows there is real demand for supermarkets and estimate $111,000,000 is currently spent on food at home, but we also drill down in the data to determine what types of items a supermarket could sell to have a competitive advantage. 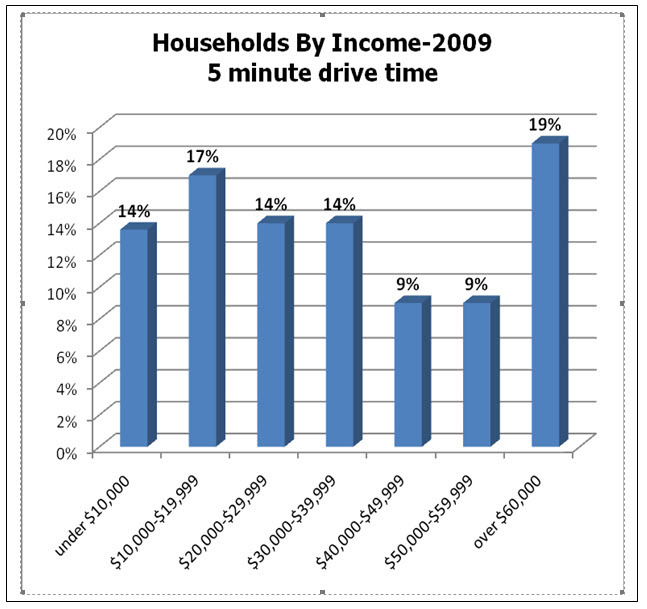 For example, within a 10 minute drive time, there is $38,000,000 spent on snacks for food at home. There is little competition for some of these needed industries. Currently there is no sporting goods store or clothing or department store in the area. 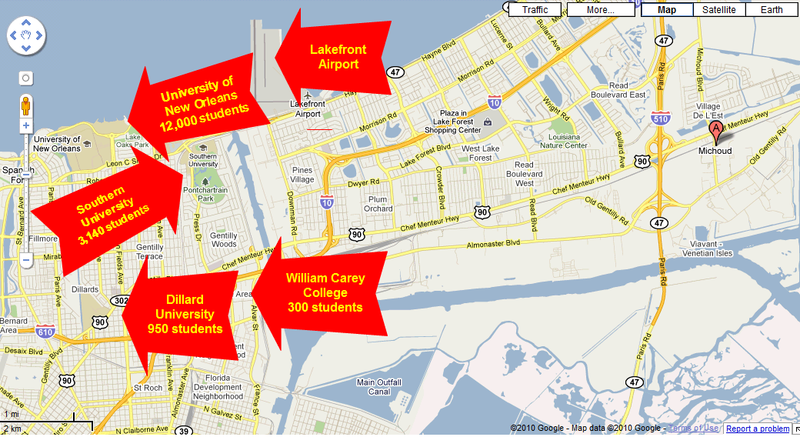 There are only two Winn-Dixie supermarkets and none along the I-10 corridor where demand is highest. The area has enjoyed a neighborhood rejuvenation with major developments such as the new Lowe’s on Read Road, a proposed library at Lake Forest, a new Methodist Hospital on Read Road near I-10 which was recently purchased by the City of New Orleans, and the new $40 million dollar Village de Jardin, a 224-unit mixed-use senior housing center near Crowder and I-10. The area is also unique in that it is close to four colleges and universities, an airport, and also major employers like NASA and Lockheed Martin. 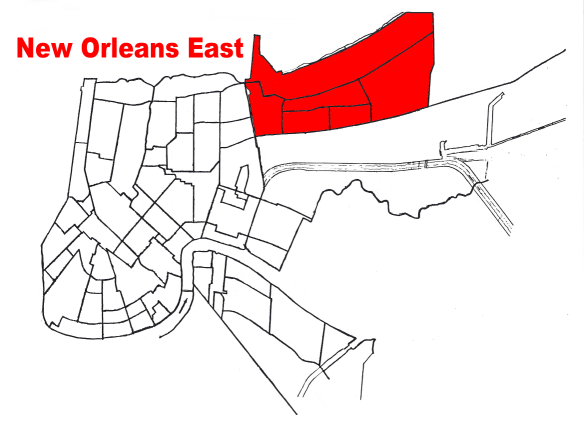 Until the late 1800’s, New Orleans East was outside of the city limits of New Orleans, although within Orleans Parish. There was little development other than in two areas. The first area hugged the long, narrow ridge of higher ground along Gentilly Road, which followed the natural levee of an old bayou. Various farms, plantations, and small villages such as Michoud were sited along this ridge. The other older area of development consisted of a linear strip of “camps”, clusters of houses raised high on wooden stilts, in the shallows along the edge of Lake Pontchartrain, the largest and longest-lasting of these being at Little Woods. In the early 1900’s some residential development of the area began, at first as an extension of Gentilly. Construction of the Industrial Canal began in 1918 and was completed in 1923, creating the principal barrier that would separate the East from the rest of New Orleans. 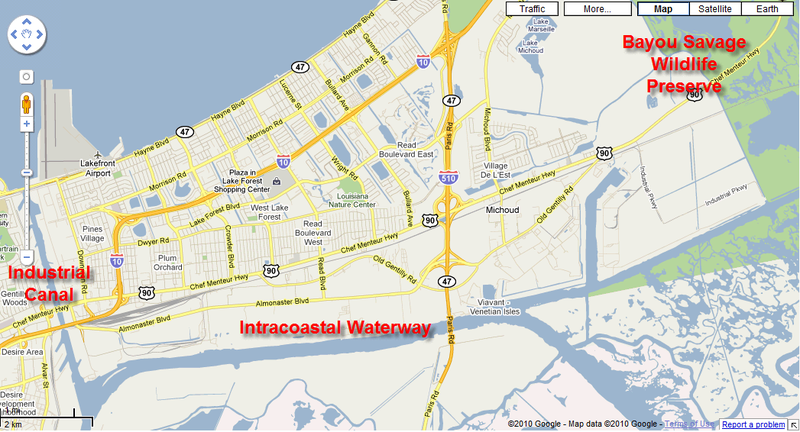 New Orleans East’s present southern boundary was realized in 1944 with the completion of a re-routing of the Intracoastal Waterway, involving the excavation of a new segment stretching east from the Industrial Canal to the Rigolets and cut through the raw swampland south of the Gentilly Ridge and north of Bayou Bienvenue. The great growth of the East did not occur until after World War II, and particularly commenced during the administration of Mayor Vic Schiro (1961–1970). Many new subdivisions were developed in the 1960’s and 1970’s, to cater to those who preferred a more suburban lifestyle but were open to remaining within the city limits of New Orleans. New Orleans East grew in a comparatively well-planned and neatly zoned fashion. Some care was taken to avoid placing major thoroughfares along the rights-of-way of unsightly drainage canals, as had frequently occurred in suburban Jefferson Parish. Instead, major roads such as Mayo, Crowder, Bundy, Read, and Bullard were located equidistant from parallel canals and were outfitted with landscaped medians, or neutral grounds. Numerous subdivisions were developed with large lakes at their centers, providing both an assist to neighborhood drainage and a scenic backdrop for the backyards of homes. From the late 1960’s onwards, buried utilities were required, lending to new development in the East a pleasingly uncluttered visual appearance quite distinct from the wire-hung stop light signals, tangled webs of power lines, and forests of leaning utility poles common to suburban New Orleans. By 1980, New Orleans East had received significant commercial office and retail investment, epitomized by the regional mall The Plaza at Lake Forest, the largest in Greater New Orleans at the time of its completion. New Orleans East is bounded by the Industrial Canal to the West, the Intracoastal Waterway to the South, Bayou Savage Wildlife Preserve to the East and Lake Ponchartrain to the North. 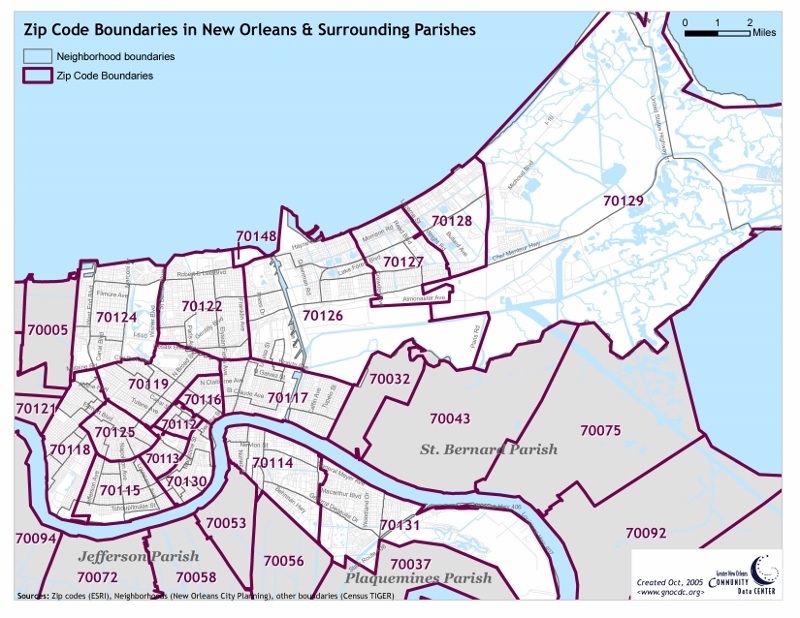 New Orleans East is primarily zip codes 70126, 70117, 70128 and 70129. St. Bernard Parish borders the area to the South. 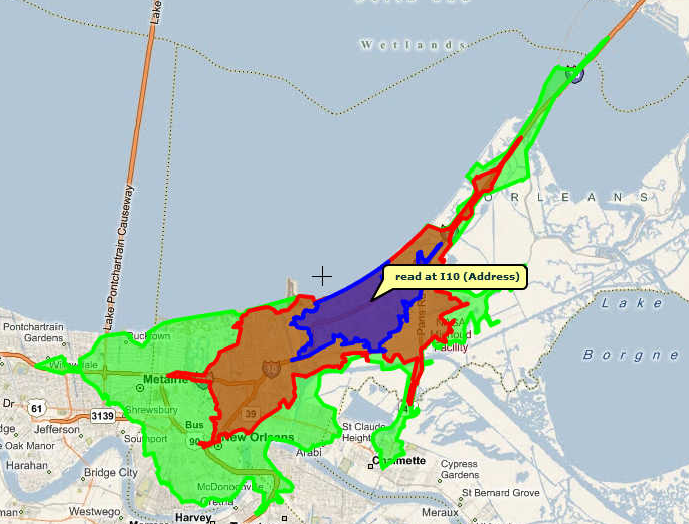 This analysis focuses on three areas designated by drive times: a 5 minute drive time (blue area), 10 minute drive time (brown area) and 15 minute drive time (green area) from the center of New Orleans East at Read Road and Interstate 10. Notice the 15 minute drive time almost reaches Slidell to the east and extends west to the French Quarter, Central Business District and Lakeside Mall. Within the 5 minute drive time, the population is estimated to grow from 35,217 in 2010 to 45,824 by 2015. This is seven times the national growth rate. The average household income in 2010 was $43,486. In addition to the population count, we can drill down in the data to determine how the population spends money, which will help determine what businesses are needed. We can examine spending behavior, which is demand, and services offered by current businesses, which is supply, and the result is the Retail Gap Analysis, which will show us what businesses are needed because of unfulfilled demand. These data are based upon national propensities to use various products and services, applied to local demographic composition. Usage data were collected in a nationally representative survey of U.S. households, and forecasts for 2010 and 2015 are prepared by ESRI. 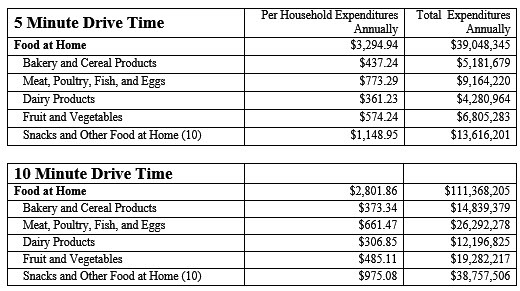 The number of adults in households that spent money in that particular category. The percent of adults in households that spent money in that particular category. The Market Potential Index (MPI) measures the relative likelihood of the adults in households in the specified trade area to exhibit certain consumer behavior or purchasing patterns compared to the United States as a whole. An MPI of 100 represents the U.S. average, and a number higher than this means a higher propensity to spend in that category, compared to the national average. Two conclusions can be drawn from consumer spending data. First, the preceding pages show where the MPI exceeds 100, meaning a higher than average propensity to spend on seafood, chicken or turkey in both the 5 and 10 minute drive time. Second, the population is high enough to support at least four supermarkets, using the assumption that a 50,000 square foot supermarket needs a population of approximately 8,000 residents. exceeds $39,000,000, and within a 10 minute drive time exceeds $111,000,000. stores, both located to the south on Chef Menteur. 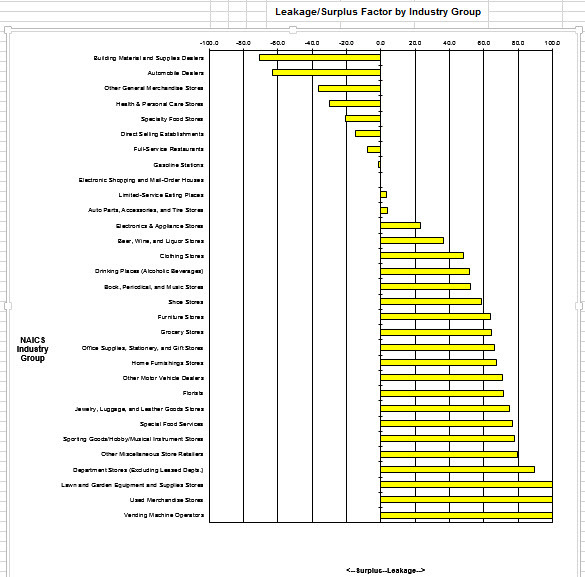 Using the industries categorized by NAICS code, research allows us to examine where demand might exceed supply which would dictate that a need for a business in that industry would exist. We can determine supply by estimating sales to consumers by establishments, but sales to businesses are excluded. We forecast demand, or retail potential, by estimating the expected amount spent by consumers at retail establishments. Supply and demand estimates are in current dollars. The gap between demand and supply is called the Leakage Factor, which presents a snapshot of retail opportunity. This is a measure of the relationship between supply and demand that ranges from +100 (total leakage) to -100 (total surplus). A positive value represents ‘leakage’ of retail opportunity outside the trade area. A negative value represents a surplus of retail sales, a market where customers are drawn in from outside the trade area. The Retail Gap represents the difference between Retail Potential and Retail Sales. Retail establishments are classified into 27 industry groups in the Retail Trade sector, as well as four industry groups within the Food Services & Drinking Establishments subsector. Developed in cooperation with Canada and Mexico, NAICS represents one of the most profound changes for statistical programs focusing on emerging economic activities. The system was developed using a production-oriented conceptual framework, grouping establishments into industries based on the activity in which they are primarily engaged. 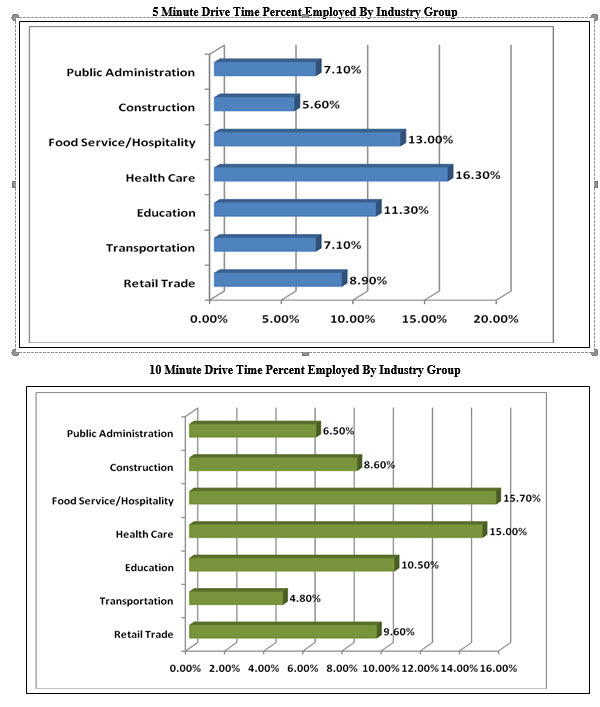 NAICS moves down in detail from Sector to Subsector to Group then to Industry. This is an improvement over the previous method, the 1987 Standard Industrial Classification (SIC) system. Research can get more specific for more detailed level of industry classification which shows unsatisfied demand for industry groups: vending machines, used merchandise retailers, and lawn and garden stores. The Michoud Assembly Facility is an 832-acre site owned by NASA and located in New Orleans East. Organizationally, it is part of NASA’s Marshall Space Flight Center. It is one of the largest manufacturing plants in the world with 43 environmentally controlled acres under one roof, and it employs approximately 3,700 people. Since September 5, 1973, it has been used for the construction of the Space Shuttle‘s External Tanks by its lead contractor Lockheed Martin. The Michoud Assembly Facility is currently a multi-tenant complex which is currently maintained and operated by Jacobs Technology. in order to allow both commercial and government contractors, as well as government agencies to use the site. The facility was originally constructed in 1940 at the village of Michoud, Louisiana by Higgins-Tucker division of Higgins Industries under the direction of Andrew Jackson Higgins on behalf of the United States government for the war production during World War II to make plywood C-46 cargo planes and landing craft. During the Korean War it made engines for Sherman and Patton tanks. It came under the management of NASA in 1961 and was used for the construction of the S-IC first stage of the Saturn V rocket and the S-IB first stage of the Saturn IB rocket. It is home to the first stage of the last constructed Saturn V, SA-515. The Michoud Assembly Facility has been most closely associated with the construction and production of NASA’s External Tank (ET) program. Throughout the Space Shuttle program, the facility produced 136 tanks. Rollout for ET-1 used for STS-1 was rolled out June 29, 1979. The last flight ready tank, ET-122, rolled out on. Only tank produced at the facility, ET-94, was not used in spaceflight and remained at Michoud as a test article. The Michoud Assembly Facility also houses other organizations such as the National Finance Center operated by the United States Department of Agriculture, the United States Coast Guard, and the National Center for Advanced Manufacturing, a partnership between the state of Louisiana, the University of New Orleans, Blade Dynamics and NASA. Within a 5 minute drive time, the growth of population in the area is 7 times the national average, and the satellite map below shows a few of the new businesses in the area such as Lowe’s, McDonald’s, Waffle House, Popeye’s, Day’s Inn, Best Western, Chase, and large developments such as the proposed Methodist Hospital and new $40 million senior housing center Village de Jardin. Village de Jardin, a 224-unit mixed-use senior housing center in eastern New Orleans between Lake Forest Boulevard and Interstate 10. The $39.7 million project, funded by the Federal Emergency Management Agency and the Louisiana Recovery Authority, is expected to be completed in 18 months. The senior housing section of the complex will consist of two apartment buildings, each five stories tall with 150 either one- or two-bedroom apartments. Space is being considered for a commercial kitchen and dining area, a covered garage, an exercise facility, a lounge, a wellness center/clinic, activity rooms, a common area and administrative and maintenance offices. The attached unit housing is composed of eight buildings with three individual living spaces connected by exterior porches and common garden areas. There will be 14 single-family garden homes. In addition, there will be 45 townhouse-style apartments and retail space for lease. The total amount of FEMA funding available for the project is $46.4 million, including $6.6 million previously obligated for demolition of the former Gaslight Apartments. The Methodist Hospital was purchased on June 16, 2010, by the city of New Orleans for $16.25 million, with Mayor Mitch Landrieu promising to redevelop the vacant building into an 80-bed public hospital that would be the first to open east of the Industrial Canal since Hurricane Katrina in 2005. Administration officials say the city is negotiating with a potential operator for a new hospital and plans to open an emergency department within a year and complete a full renovation sometime in 2013 to serve a population base now at 77,000 and projected to be 105,000 by 2014. The total redevelopment, according to the Landrieu administration’s 100-page review of the health care system in eastern New Orleans, is projected to cost $110 million. In the 5 minute drive time, population from 2000 to 2009 declined from 67,717 to 32,391. The population is expected to grow to 45,693 by 2014. The household growth rate from 2009 to 2014 is among the highest in the US at 7.28%. The annual growth rate in the area of 5 minute drive time is 7 times the state and national average (see chart below, Trends 2009-2014). Population within a 5 minute drive time exceeds the US average in every age group below 35, and the 55-64 age group, and 37% of the population with a 5 minute drive time earns over $40,000 annually. 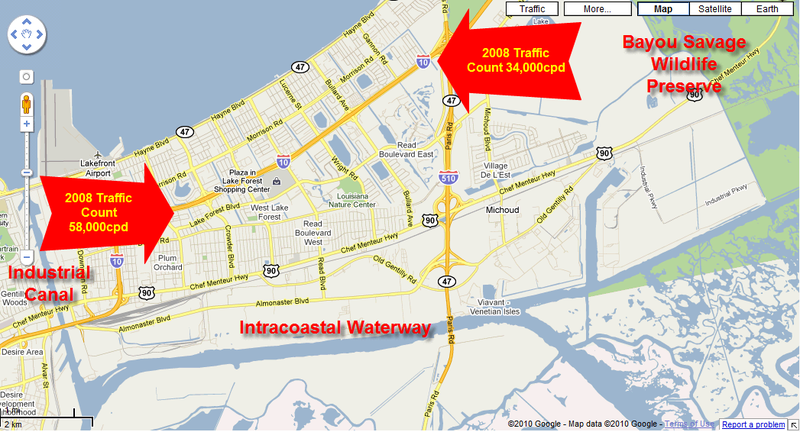 The 2008 traffic study by the Louisiana Department of Transportation showed the I-10 traffic in New Orleans east between 34,000 and 58,000 cars per day. For a copy of the report in pdf format with original tables and charts, email the author at roberthand@cox.net. New Orleans Commercial Real Estate-What Are Current Office Trends?